Andrew Holbrook « pixels …everywhere. Pixels around us. Pixels on us. A repeated theme of this blog is ‘pixels everywhere’ …not just everywhere around us but even everywhere on us. We’re fast becoming part of the digital canvas. For example, there’s been a lot of work in using digital light to illuminate our bodies for medical purposes. One excellent example I’m very familiar with is Christie’s VeinViewer. laser technology). In one example, Stanford grad student Andrew Holbrook combined a MicroVision picoprojector with a magnetic resonance imaging (MRI) system. The MRI output is painted directly onto the patient as shown on this picture from the MicroVision blog. Impressive. In the other example, researchers in Bern, Switzerland have built a small handheld device with a MicroVision projector built-in. 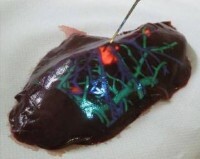 The idea is to project details of a human organ directly on the organ itself to aid surgeons. From an illustration on the blog posting, it looks to me like the orientation of the device is detected by markers on the device and this is used to adjust the projected image accordingly. If so, this would be different from the VeinViewer which incorporates a camera to directly image the skin. Whatever method is used, though, applying digital light to illuminate and inform doctors will become more and more important. Laser light, as used by MicroVision, is capable of staying in focus over a very long range of distances which is useful for imaging on irregular surfaces like these. Let me know of any other examples of this sort of use of digital light, dear readers!